This Lanternfly was not happy when I removed his Tree of Heaven. 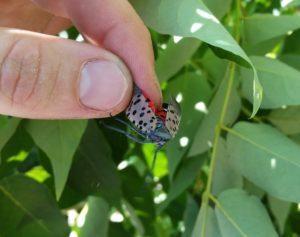 The Spotted Lanternfly was first observed at Treehouse World in August, 2018. The Lanternfly is known to feed on and lay eggs on about 60 native species, including many well common Pennsylvania species located on our property such as Sycamore, Walnut, Oak, Maple, and Cherry. The preferred host of the Lanternfly is Ailanthus Altissima, which is commonly referred to as Tree of Heaven or Chinese Sumac. Reducing or eliminating these trees will go a long way toward reducing the spread of the Lanternfly. These Lanternflies returned to the log of the tree I cut. To protect your trees, then the first step is to remove all Tree of Heaven. Alternatively, some serious Lanterfly haters will leave about 10% of the trees and setup sticky traps on them. Cutting Tree of Heaven does not kill the root system, so you need to go back and cut suckers each year or use an insecticide to kill the root system. We have already removed most of the Tree of Heaven on our 14 acre treehouse park, and are going to set traps next season during the Lanterfly nymph stage which begins in May. However, we can’t fight this war alone. Tree of Heaven is invasive and grows along highways right next door and all throughout the county. We need help from our neighbors, townships, and road crews to control the invasive plant. 1. The leaf is compound, meaning a lot of leaflets on each leaf – about 10-20 leaflets. The leaflets have a bump or mini-lobe at the base. 2. Break a leaf off, and crush the stem. A strong peanut butter smell is a dead giveaway. 3. Walnut and Sumac are common lookalikes. Walnut trees don’t form walnuts until they are large, so you have to compare the different bark, smell (#1 above), and unique shape of the mini lobes on the leaf (#2 above) to tell them apart. Sumac has a different smell, flower, and leaf, although at a distance the compound leaf structure looks identical. With some practice, I’ve gotten quite good at it. 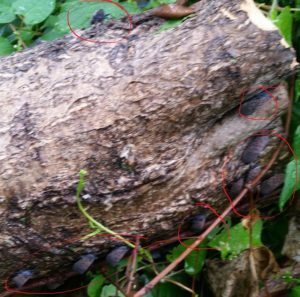 Lastly, please avoid moving firewood or other objects with Lanternfly egg masses! Please help protect our trees! Thanks!